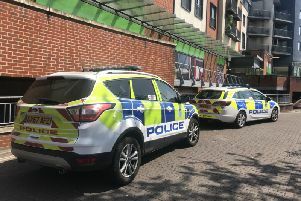 Two people remain in custody after a man was ‘stabbed’ in Crawley High Street. Sussex Police was called to a report of a stabbing in Crawley High Street just after 10pm on Thursday (September 3). A spokesman said three people were taken into custody following the attack which saw a man in his 40s taken to hospital with a suspected stab wound. A spokesman this morning said: “A 46-year-old man was taken to hospital with non-life threatening injuries. “A 46-year-old man from Liverpoool was arrested on suspicion of GBH and remains in police custody. Several police cars and a police van were called. Officers restrained a man and carried him into the van. Police cordoned off an area around where bloodied clothes had been left. Witnesses were asked to call Sussex Police on 101 and quote 20150903-1555.